It may be hard to believe, but Rocky is 40 years old, having made its debut all the way back in December of 1976. Not that we need an reason to celebrate one of the most revered franchises in movie history, but this big anniversary makes for a convenient excuse to look back on some of the greatest sports movies ever made... And also Rocky V.
From his humble beginnings in the slums of the big city, to his rise to superstardom, fall from grace, and unexpected resurgence, the Rocky series has echoed the career of its star and frequent writer/director, Sylvester Stallone. To an extent, Rocky can be seen as a record of his feelings on his life and career over the decades; after all, Sly himself wrote six of the seven movies, and directed four of them. Let's take a look back on the entire series, from the original 1976 classic, to one of 2015's surprise breakout success stories, Creed. The legend goes that Sylvester Stallone was in something of a rut by the mid 1970s. He was poor, failing as an actor, and on the brink of failure in his aspirations of stardom. In an effort to avoid being typecast as a muscle-bound thug, Stallone decided that he needed to write a film of his own, in which he could star as the romantic leading man. That film turned out to be Rocky. Stallone shopped his script around to various studios, but he would only agree to make the movie if they let him star in it. This made things difficult, to say the least, as the big studios had little faith in the unknown actor. By this point, Stallone's most noteworthy acting role had been as a dignified extra in Woody Allen's Bananas. Bigger names that were considered to star in the film included James Caan, Burt Reynolds, and Robert Redford. Ultimately, United Artists relented, and allowed Stallone to star in the movie, but with an exceptionally modest budget in an effort to minimize expected losses. Directed by John G. Avildsen (Joe, The Karate Kid), Rocky had a budget of just over one million dollars - a pittance, even by 1976 standards. While Stallone is a Brooklyn native (his trademark accent is unmistakable), the film made tremendous use of its Philadelphia setting, making great strides to capture the gritty dignity of the inner city. Rocky himself is the hired muscle for a local low-rent mob boss, though he is too soft-hearted to actually beat anyone up for the affably menacing mobster, played by Joe Spinell. Like Stallone himself at the time, the character of Rocky Balboa is seen as a man with skill and talent, who just never made it off the ground. He's a loser who could have been great, but never took the steps required to make it happen. Suddenly, he gets his chance when Apollo Creed, the Heavyweight champion of the world, offers him a challenge, giving Rocky the opportunity of a lifetime, a genuine shot at the title. After initially facing ridicule from his peers, as well as his own self-doubt, Rocky decides to make the most of this chance, and resolves to "go the distance" with Apollo. He doesn't really believe he can beat him, but he vows to himself that he will, at the very least, go the full 12 rounds, proving once and for all that he's not a bum. Along for the ride are a cast of colorful, but realistic and fully-realized characters, including love interest Adrian (Talia Shire), her cantankerous brother Paulie (Burt Young), and Rocky's initially-reluctant trainer, Mickey (Burgess Meredith), to say nothing of the main opponent, Apollo Creed (Carl Weathers). Each of these faces would return for numerous sequels, becoming as much a staple of the series as Rocky himself. Box office expectations were low for Rocky, but it became a huge hit for United Artists, and the highest-grossing movie of 1976. Rocky brought in $117 million at the domestic box office; adjusted for inflation, that number balloons to a shocking $473 million, a mega-blockbuster result by any metric. The film earned universal acclaim, including 10 Oscar nominations, and it won Best Picture and Best Director; while Stallone was nominated twice, for his script and his performance as lead actor, those awards ultimately went to Paddy Chayefsky and Peter Finch, respectively, for their contributions to Network. Still, the message of Rocky is that it's not about fame and awards; it's about self-respect. Rocky, the film, was the product of Sylvester Stallone's hard work, dedication to the art, and belief in his own self-worth. 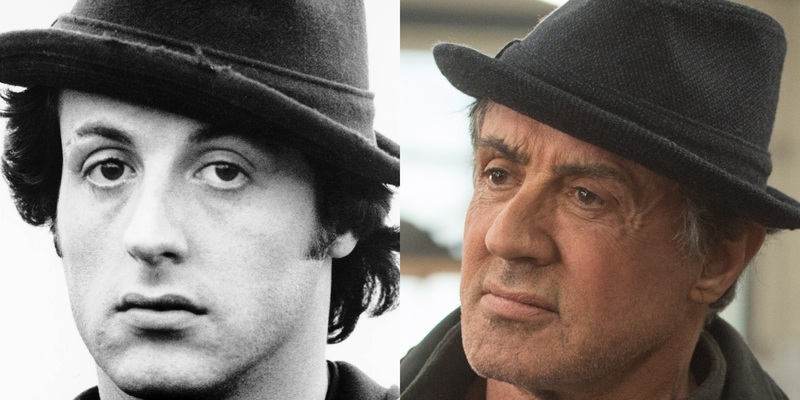 Sly went the distance, and immediately became one of the biggest movie stars on the planet. Although Rocky was a decidedly self-contained story about one man's quest to prove his self-worth to the world, its stunning box office performance made a sequel an inevitability. Three years later, in 1979, fans got a second dose of the Italian Stallion with Rocky II. Apollo Creed, despite winning the climactic fight at the end of the first film, was heavily favored to win by a decisive knock-out, not such a hotly contested split decision. Creed may have one the fight, but Rocky won the hearts and minds of everyone who saw the championship bout. Fortunately for Apollo, Rocky's attempts at finding work outside of boxing all fail, and Philly's champion has no choice but to return to the ring to provide for his now-wife Adrian, who is pregnant with their son. Despite potentially debilitating health problems, Rocky agrees to a rematch with Apollo, and this time, he's not just aiming to go the distance; he's fighting to win. 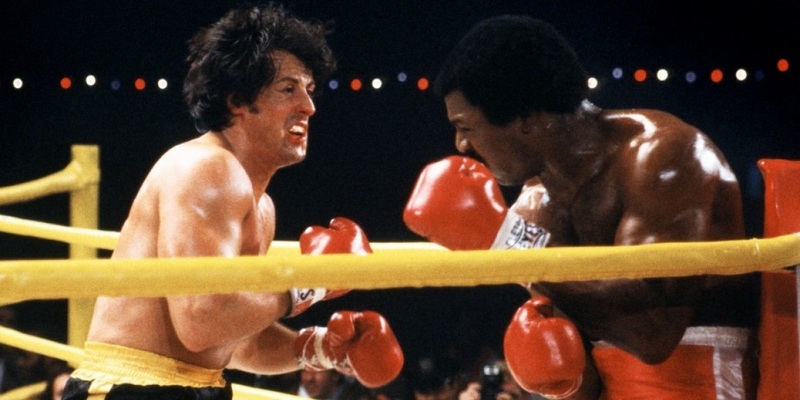 Unlike the first film, which Sylvester Stallone only wrote and starred in, Sly wrote, directed, and starred in Rocky II. Stallone would pull triple duty like this for Rocky III, Rocky IV, and Rocky Balboa, as well as non-Rocky films like 2008's Rambo and 2010's The Expendables. However, by 1979, Stallone had only handled directorial duties on a single film, the little-seen Paradise Alley, and it shows; Rocky II, despite benefitting from a larger budget of $7 million dollars, suffers from a noticeably flatter look than the original, as though Stallone is not entirely comfortable in his role as director; Sly's too shy to get overly creative. Meanwhile, the script, again, also by Stallone, is a decent successor to the original, although it leans a bit too hard on overwhelming melodrama, like when Adrian winds up in a coma or the potentially career-ending damage to Rocky's eye, which comes up time and again without ever leading into anything of note in this film, and s completely dropped in the sequels. Rocky II isn't exactly a slam-dunk (or a knockout, to stick to boxing terms), but it's a solid follow-up with more of the same uplifting spirit, and some new challenges for Rocky to overcome. This sequel shines brightest when it takes the Rocky character and puts him in new situations; he's never been rich before, so, of course, he's going to spend his money foolishly, only to find himself flat broke once the dust settles. It's a realistic and sobering look at the life of what happens immediately following a classic "happily ever after" ending. Spots of brilliance like this are what keep Rocky II from being just a lesser rehash of the original, but a strong and respectable film in its own right. 1982 saw the release of Rocky III. First and most importantly, "Eye of the Tiger," by Survivor, was written for the movie and became a pop culture phenomenon, as well as one of the most iconic rock and roll songs of all time. In the annals of Rocky's legendary soundtrack, "Eye of the Tiger" is right up there with Bill Conti's "Gonna Fly Now" as the most recognizable tune in the series. Unlike Rocky and its first sequel, which are grounded and realistic dramas, Rocky III marks the start of the second phase of the series, where the film switched gears into being straight-up 1980s cornball action flicks. This isn't necessarily a bad thing, but it's certainly a marked departure from its gritty Philladelphia roots. In Rocky III, The Italian Stallion is pitted against Hulk Hogan (as the hilariously named Thunderlips) in a gimmicky "boxing vs. wrestling" charity match which makes no sense and adds nothing to the plot. It's just a bizarre and enjoyable indulgence of the film. In Rocky III, Rocky is on top of the world. He's the undefeated heavyweight champion of the world, and nobody can hold a candle to his dominance in the ring... Nobody, that is, except for Clubber Lang, played by Mr. T. These days, Mr. T is best known for being the family-friendly mascot of the entire decade of the 1980s, but here, in his film debut, he's a totally menacing presence, akin to something of an "evil mirror universe" version of the young and hungry Rocky of the first film, while Rocky himself resembles Apollo in his first appearance, overconfident to a fault and completely underestimating his opponent. 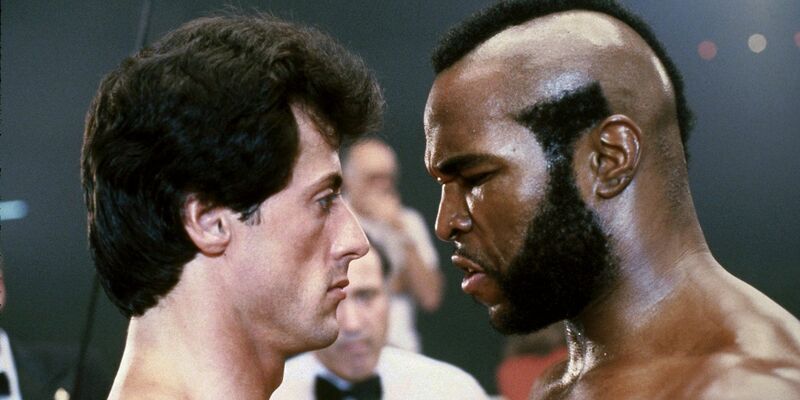 In their first battle, Clubber Lang utterly wipes the floor with Rocky, knocking him out in the second round. To make matters worse, Mickey dies of a heart attack immediately after, and Rocky is left beaten and broken, both physically and psychologically. Ultimately, it takes none other than Apollo Creed to get Rocky back in the ring to take down Lang, once and for all. Rocky III is by no means a great movie, but it's certainly watchable and a lot of fun. Stallone has a knack for infusing inherently silly movies with lots of genuine heart; despite its heightened sense of wonder and action movie aesthetics, Rocky III is still true to the characters from the original. Big time Hollywood franchises must evolve or fade away, and Rocky adapted to the 1980s with style aplenty and with just enough grace to avoid being a total parody of itself. Rocky III may have been an over-the-top spectacle, but it looks downright subtle in comparison to its sequel - the gloriously bombastic Rocky IV. It's corny beyond all compare, but also righteously sincere and utterly delectable from start to finish. In the first three movies, Rocky was all about one man's journey to go the distance and prove his own self-worth; in Rocky IV, he practically wins the entire Cold War by himself. 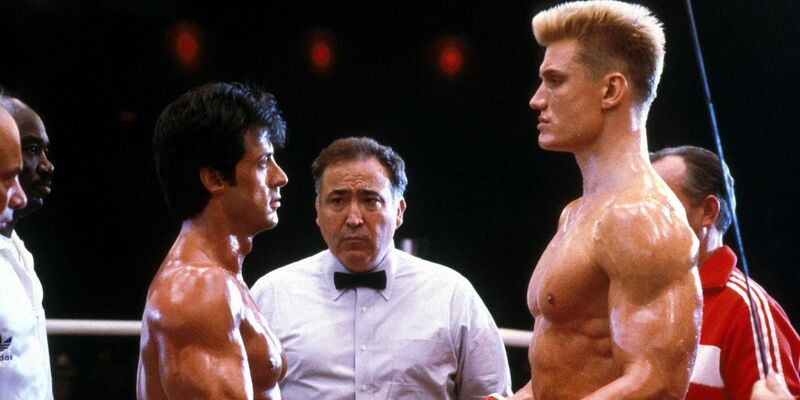 The film opens with Apollo Creed coming out of retirement to face one final challenger: the juiced-up Russian juggernaut, Ivan Drago, played with stoic aplomb by Dolph Lundgren. The match is a hugely-hyped affair - an East vs. West bout to ostensibly decide the future of mankind. Heck, Creed even enters the ring to a live performance by none other than "Soul Brother Number One" himself, James Brown. The decadent display borders on garish, and Creed's commitment to his aesthetics rather than training proves to be a fatal mistake for the aged fighter. Apollo is wholly unprepared for the Drago's offensive onslaught and suffers such a crippling defeat that he actually dies in the ring. For such a jolly and ridiculous movie, it certainly opens with a shocking and unexpectedly heartwrenching beatdown. Apollo Creed always represented the patriotic celebratory spirit of America, and to see him get massacred by Drago is almost too brutal to watch. 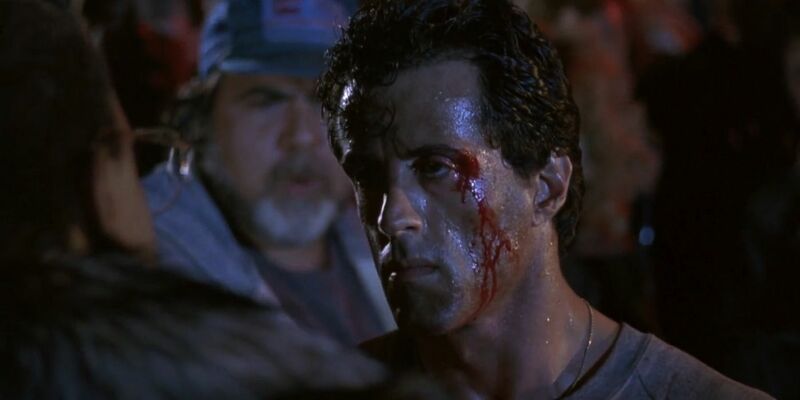 After watching his friend go down for good, Rocky resolves to fight Drago himself, avenging his friend, and his country. It's a total cartoon, but still a jolly delight. 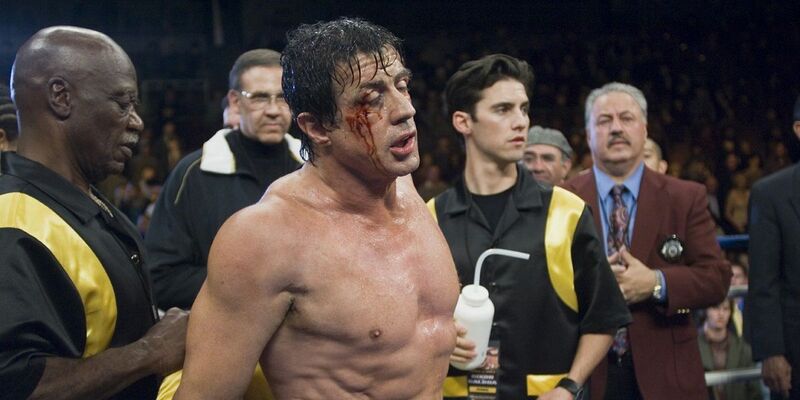 While the script is paper-thin, Sylvester Stallone's confidence as a director had improved considerably; the fight scenes have a totally new kinetic energy, and the numerous training montages are all masterpieces of style and editing. We'd be remiss if we didn't mention Paulie's robot. For no good reason, Rocky gifts his brother-in-law with a pet robot, a downright idiotic plot point which serves no purpose other than to give Burt Young something to do in the film and pad out its meager 91-minute running time. Some fans appreciate its incoherent lunacy, but others see Paulie's robot butler buddy as the Jar Jar Binks of the Rocky series and a serious derailment of Paulie's character arc from earlier films. Rocky III and Rocky IV may not be for everyone, but Rocky V isn't for anyone. 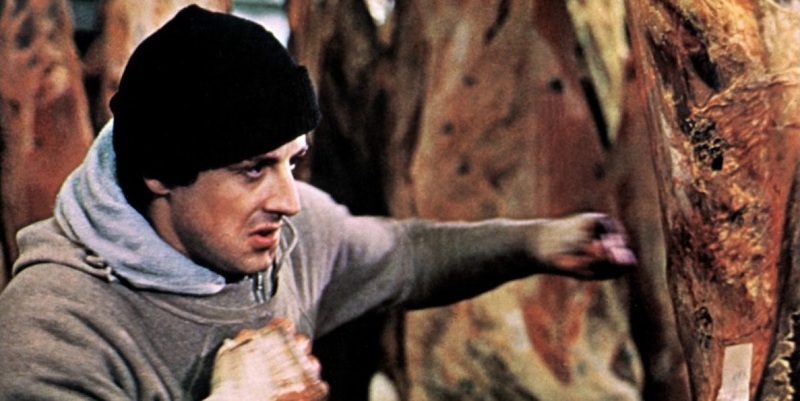 In an attempt to bring the series back to its roots after the increasingly over-the-top antics of the previous two sequels, John G. Avildsen, director of the original film, was hired to bring the series back to basics, to return Rocky to his Philadelphia roots. Unfortunately, it didn't quite work out as planned. In 1990's Rocky V, Rocky discovers that he can't fight anymore due to brain damage sustained from years of being punched in the face for a living. Meanwhile, his shady accountant manages to lose all of his money. Broke and unable to fight professionally, Rocky is forced to sell all of his possessions and move back to Paulie's old house in urban Philly. It's a bit far-fetched, to be sure, but it's an efficient way to get Rocky back on the familiar streets where he belongs, away from the glitz and glamour of Rocky III and IV. Despite bringing back the aesthetics of the original film, Rocky V only pays empty lip service to its themes of dignity and self-respect; after Rocky's new protégé, Tommy Gunn, betrays him for an unscrupulous Don King-esque promoter, the two fighters wind up settling their differences in a no-holds-barred bare knuckle street fight. Until now, Rocky Balboa had never been reduced to such an undignified display of his fighting skills, and it's sad to see the character reduced to fighting in the street like a bum. That being said, the fight, while certainly a low point of the character's arc across the series, is impeccably directed and edited. It's a fight unlike anything else in the series and certainly possesses a strong visual punch, if not an emotionally resonant one. Rocky V bombed at the box office. After Rocky IV brought in a series-high (without adjusting for ticket price inflation) $127 million, part five could only muster up $40 million, a series low by a wide margin. As a result, the franchise was considered dead, with little hope for further sequels. After all, Sylvester Stallone was 44 years old by now. For all intents and purposes, the era of Rocky was over. Bringing the character back as an old man would just be silly... Right? Somehow, Rocky returned for one more fight, and it turned out to be the greatest film in the series since the original. First revealed in the pages of the short-lived and seriously ill-advised Sly Magazine, Rocky Balboa came out in 2006, a full sixteen years after Rocky V. To the film's credit, Rocky Balboa makes no effort to hide Stallone's age; Rocky is the same age as Stallone, 60 years old. While the film doesn't acknowledge the events of Rocky V, Balboa is seen living in his humble Philly house, roaming his old streets like a ghost. He doesn't just live in Philly; he is Philly, beaten down by years of decay and the world passing him by. After Adrian's death from cancer in 2002, Rocky had lost the will to go on, and is shown to be more-or-less content to live out his golden years in the shadow of his own past. However, a computer-generated simulation, pitting Rocky in his prime against the current heavyweight champion, Mason "The Line" Dixon (played by real-life boxer Antonio Tarver), inspires Rocky to get back in the ring and fight locally, just to keep from getting too rusty. Of course, it doesn't take too long for high-profile fight-promoters, dollar signs in their eyes, to set up an exhibition match between Rocky and Dixon. Initially reluctant, Rocky eventually decides that this is his chance to prove that, just because he's old, it doesn't have to mean he's done. Rocky Balboa is what Rocky V should have been, but bigger and better due to the 2006 setting. Rocky's age isn't a hindrance - it's the crux of the movie, what makes it special and relevant for fans of the series and to Stallone himself. Sly is Rocky. After the failure of Rocky V, Stallone had a string of flops and he was declared a has-been. Rocky Balboa was his chance to show that he wasn't done, that he was still capable of writing, directing, and starring in incredible movies, even as an old man whose career had been up, down, and everywhere in between. Rocky says in this film, "It ain't about how hard you can hit; it's about how hard you can get hit and keep moving forward." It's a declaration from Stallone, that he's not going down without a fight. For our money, Rocky Balboa has the best training montage in the whole series, prefaced by a righteous speech from Tony "Duke" Evers, played by Tony Burton, one of only three actors to appear in each of the first six Rocky films. He explains that Rocky is old, slow, and lacks the stamina of his younger opponent. The only thing he can do to survive in the ring is to build his arms into veritable pain cannons. Cue "Gonna Fly Now." 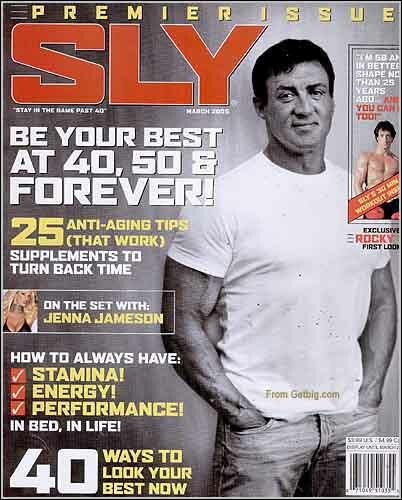 The success of Rocky Balboa could only be matched by the complete and utter failure of Sly Magazine. Seriously, we cannot overstate how much of a disaster that publication was. It only lasted for four issues in 2005 before mercifully disappearing without a trace. Rocky Balboa sent Stallone's most famous character into the sunset, having proven himself one last time. However, just like how Rocky II deals with what happens after "happily ever after," so too does Creed show the aftermath of "one last fight." In Rocky Balboa, the character was 60. Ask any elderly person and they'll tell how exercise and diet can slow down the aging process, but nothing can stop it, especially after the age of 65 or so. Rocky Balboa corrected the mistake of Rocky V and gave the character a proper goodbye, and the book was closed, but life goes on. Then, practically out of nowhere, director Ryan Coogler (Fruitvale Station) came up with the idea for a sequel/spin-off to the franchise. Once again, against all odds, Rocky returned to the silver screen, and, like Rocky and Rocky Balboa before it, the final result proved better than anybody could ever have expected. 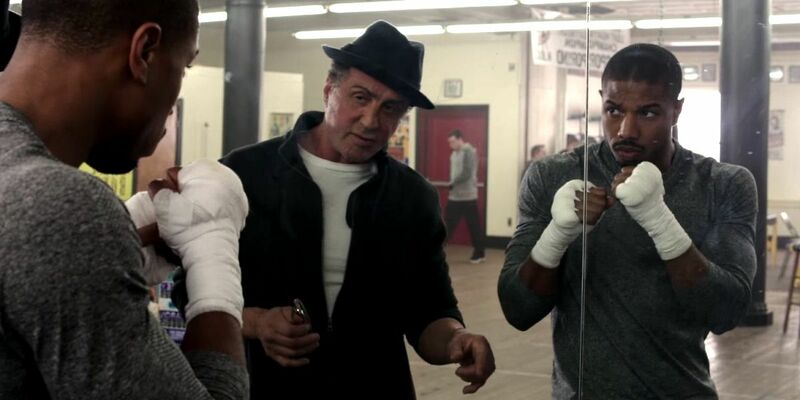 2015's Creed finds Rocky at around 70 years old, and content with his life's work. By now, Paulie is buried next to Adrian, and Rocky is patiently waiting for his own death so he can join them in the afterlife. However, an unexpected surprise gives Rocky a reason to return to the world of boxing... No, not as a fighter, but as a trainer, to Adonis, (Michael B. Jordan), the secret son of Rocky's late best friend, Apollo Creed. After much persuasion, Rocky agrees to take Adonis under his wing and guide his career as mentor and trainer, ultimately becoming a surrogate father to the gifted, if hotheaded, youth. Along the way, Rocky finds himself fighting his own personal battle against a terminal illness, just in time for this young man to give him a reason to embrace life again. Coogler directs with a strong respect for the history of the series and for the Rocky character, while simultaneously embracing a new era. 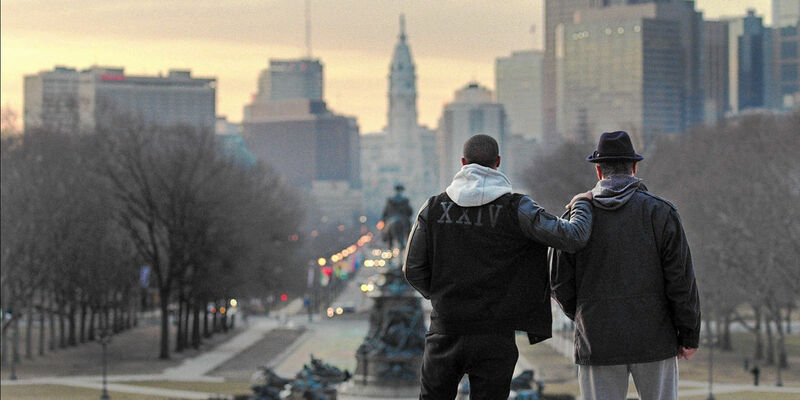 This fusing of old and new is a testament to the timeless nature of Rocky's story, as well as the continuing importance of the Philadelphia setting to the series; alongside Rocky himself, Philly is the element which defines the identity of these movies. Sylvester Stallone won a Golden Globe for his work in the film, and was nominated for an Oscar for his seventh turn as Rocky Balboa. Unfortunately, neither Michael B. Jordan nor Ryan Coogler were recognized by the Academy Awards for their efforts on this long-shot success story. #OscarsSoWhite, indeed. A Creed sequel has been tentatively scheduled for November of 2017, but time will tell if the filmmakers will stick to that release date. While we would love for Ryan Coogler to return to helm the continuing story of the Rocky universe's newest champion, the in-demand director currently has his hands full with Marvel's upcoming Black Panther film. Coogler has said that he may not direct, but that he will certainly be involved in the sequel, one way or another. Jordan and Stallone are all but certain to return to star, but we are happy to wait. A sequel like this needs to be done right, or not at all. We don't know what the future holds in store for Adonis Creed and Rocky Balboa, but we know we want to be there when it happens.